Share the post "Album review: JAMES WARREN – Innocent Bystander"
David Randall chatted to James Warren in June 2017 about his career. First broadcast on Get Ready to ROCK! Radio, 25 June 2017. It’s a good time at the moment for eighties-based music. With bands like ABC and Johnny Hates Jazz lined up for autumn/winter tour dates and regular blow-outs at Butlins we’ve come to acknowledge that the decade wasn’t all bad. And there were still songwriters working away without the prop of synthesisers and technology. Of course James Warren isn’t a child of the eighties: far from it, he got his first gig with pop to prog rockers Stackridge at the turn of the 1960s. But it was only in the 1980s that his songwriting and vocals really flowered with The Korgis who typified the decade’s pop sensibilities. Warren’s solo albums that have crept out almost unnoticed since the mid 1980s are a perfect prelude to ‘Innocent Bystander’ and well worth checking out (Also on Angel Air). ‘Innocent Bystander’ brings Jim’s story up to date and is the sum total also of his early influences. The stomping ‘That’s What You Do To Me’ is redolent of ‘Keep On Running’ (Spencer Davis Group) and a similarly upbeat ‘Everybody Needs Somebody To Love’ harks back to an earlier, simpler age of a weekly Top Of The Pops diet and a more eclectic BBC Radio 1. The album is characterised by Warren’s distinctive vocals although on ‘You’ve Got The Love That Matters’ he shares with Steve Robinson and John Baker. Throughout the album he’s assisted by erstwhile Stackridge colleague, Glenn Tommey (co-writing and keyboards) whilst long time musical partner Andy Davis crops up on a couple of tracks. This includes the semi-psych pop ‘Have You Seen The Colours’. ‘High Time’ tips a wink to another great influence, the Fab Four in their ‘I Am the Walrus’ phase. To add eighties authenticity the album is co-produced with another of Bath’s great musical alumni, David Lord, perhaps better known for his work with Peter Gabriel and Tears For Fears at the dawn of the decade. Throughout, there are motifs which evoke a seemingly bygone age of classic songwriting. For example, on another standout – ‘That’s How I’m Loving You’ – in the bridge section there are echoes of Lionel Richie’s ‘Hello’. 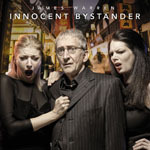 This entry was posted in ALBUM REVIEWS, ALBUM REVIEWS (Mobile), All Posts, INTERVIEWS, Radio interview and tagged 80s, album, Innocent Bystander, interview, James Warren, pop, review, rock, singer, songwriter, Stackridge, The Kogis. Bookmark the permalink.